OBJECTIVE: To evaluate the effect of different surface treatments and bonding modalities on the shear bond strength (SBS) between metallic orthodontic brackets and zirconia crowns. MATERIALS AND METHODS: Sixty zirconia specimens were computer-aided design/computer-aided manufacturing milled, sintered, glazed, and embedded in acrylic resin. The specimens were divided into three groups according to the surface treatment applied: C: no surface treatment (control), S: sandblasted with 50 μm Al2O3, and D: Sof-Lex disc roughening. Each group was further subdivided into two subgroups according to the resin cement used: P: Clearfil Ceramic Primer + Panavia F2.0 (Kuraray) and R: RelyX U200 (3M/ESPE). Metallic orthodontic brackets were bonded to the labial surface of the specimens. All specimens underwent thermocycling. 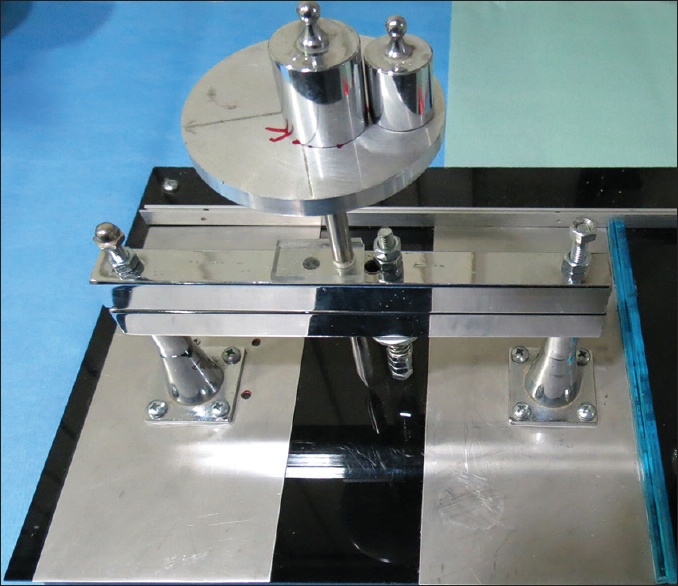 SBS test was applied using a universal test machine at a cross head speed of 1 mm/min. Data were analyzed using Mann–Whitney test (α = 0.05). RESULTS: Subgroup SP showed the highest SBS (20.8 ± 4.8 MPa), followed by subgroups SR (16.7 ± 4.6 MPa), DP (12.3 ± 2.8 MPa), and DR (11.6 ± 3 MPa). However, all specimens in the control group underwent debonding during thermocycling. The different surface treatment groups showed highly significant differences (P < 0.05), whereas the resin cement subgroups showed no significant differences (P > 0.05). CONCLUSION: SBS between glazed zirconia crowns and metallic brackets strongly depended on the surface treatment applied. Sandblasting achieved the highest SBS. Roughening with Sof-Lex disc proved to be a reliable surface treatment modality for glazed zirconia. Bonding to untreated glazed zirconia surfaces led to bond failure. Both resin cements yielded strong SBS results. The demand for esthetic restorations goes hand in hand with the pursuit of beauty, so ceramic crowns, veneers, and prostheses are now widely used in the dental field. 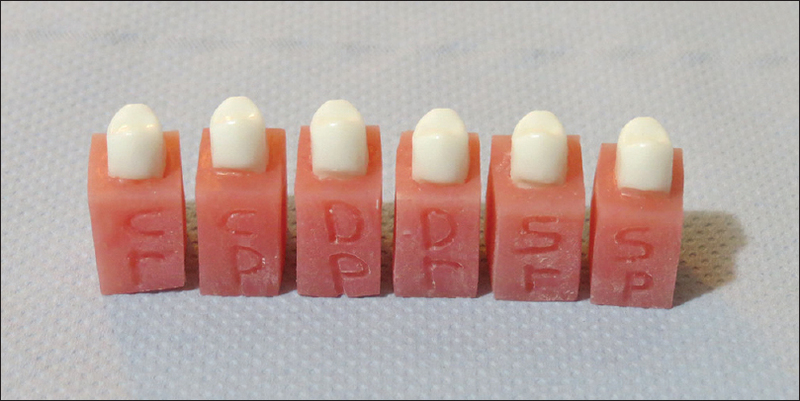 Full monolithic zirconia crowns are preferred by many dentists and patients due to their color stability, biocompatibility, high flexural strength, wear resistance, and elimination of veneer delamination risk. Contrarily, the awareness among adults about the importance of occlusion has increased, and the number of adults seeking orthodontic treatment is rapidly growing. Achieving a good bond to enamel can be accomplished by applying phosphoric acid to the enamel before bonding. Etching of feldspathic ceramic surfaces with 9.6% hydrofluoric acid also causes micro retentions that can achieve a good bond. However, the glass-free nature of zirconia is resistant to all these methods, so other bonding procedures must be considered., Orthodontic brackets need to withstand intraoral masticatory forces, necessitating a minimum bond strength of 5.9–7.8 MPa to maintain a good bond through the orthodontic treatment. Improving bonding to zirconia can be achieved mechanically by modifying the zirconia surface, chemically using innovative primers and resin cements, or preferably both.,, Primers containing 10-methacryloxydecyl dihydrogen phosphate (MDP) have improved the bonding to a zirconia core by the chemical bond that forms between zirconia oxides and the free end chains of MDP. One of the most currently used surface treatment for zirconia is sandblasting (airborne particle abrasion) using Al2O3 particles. Since sandblasting requires the use of an intraoral micro-blaster, which is not available in all orthodontic clinics, we used polishing discs as an alternative in this study. Previous studies showed that repolishing a flat zirconia surface with Sof-Lex discs or an NTI polishing kit restored its initial smooth texture. However, to our knowledge, no study has yet evaluated the use of polishing discs as a way to increase the mechanical retention on glazed zirconia. The aim of this study was to evaluate the shear bond strength (SBS) between glazed zirconia and metallic brackets using different surface treatments and two resin cements. Sixty identical zirconia specimens (Yeti-Dental, Digital Line, Germany) were fabricated using computer-aided design/computer-aided manufacturing technology (Wieland Dental, Zenotec Select, Germany). The specimens were designed to be identical to a natural-size crown and to simulate the contour of the buccal surface of the lower second premolar with a stump base. The specimens underwent sintering for 9 h in a zirconia-sintering furnace (Programat S1, Ivoclar Vivadent), with temperature reaching 1500°C, for 2 h. A glaze layer (Glasur, Degudent) was applied to all the specimens and fired for 15 min in a ceramic furnace (ProFire 2 Press, Degudent). One specimen was mounted in a stone base, simulating its position in the oral cavity, and three industrial silicon molds (Catasil 21; Vertex, Switzerland) were made for this specimen. Each specimen was placed in its proper indentation in the mold, and chemical-cured acrylic resin (Meliodent, Heraeus Kulzer, Germany) was then poured to fill the mold. This procedure was repeated to obtain 60 identical specimens. All the specimens were bonded with stainless steel Discovery brackets #790-123-00 (Dentaurum GmbH, Ispringen, Germany) for a lower second premolar with a laser-structured base. The average surface area of the bonded bracket was 13.42 mm2. The specimens were randomly divided into three groups (n = 20) according to the surface treatment applied: C: control, glazed specimens without any surface treatment, S: sandblasted using an intraoral sandblaster (Microetcher IIA, Danville Materials, CA, USA) with 50 μm Al2O3 particles for 15 s, under 2.8 bars of pressure at a distance of approximately 10 mm perpendicular to the surface, and D: roughened with coarse polishing discs (Sof-Lex 2382C, 3M ESPE) at 10,000 RPM for 5 s; each disc was used only once and then discarded. Each group was further subdivided into two subgroups with respect to the resin cement used: P: “Clearfil Ceramic Primer (CCP) + Panavia F2.0 (Panavia)” and R: “RelyX U200,” resulting in six subgroups: CP: glazed, CCP + Panavia, control; CR: glazed, RelyX U200, control; SP: glazed, sandblasted, CCP + Panavia; SR: glazed, sandblasted, RelyX U200; DP: glazed, Sof-Lex Disc, CCP + Panavia; and DR: glazed, Sof-Lex Disc, RelyX U200. [Figure 1] shows a diagram summarizing the groups, subgroups, variables, and outcomes. Before the bonding procedures, the specimens were cleaned with an ultrasonic device in isopropanol solution for 3 min, rinsed with water, and then air dried [Figure 2]. For subgroups P, a thin layer of Clearfil Ceramic Primer (Kuraray, Noritake, Japan) was applied using a microbrush to the bonding surface and left to react for 1 min. Equal amounts of Panavia F2.0 (Kuraray) Paste A and Paste B were then mixed following the manufacturer's directions. For subgroups R, no primer was applied. The resin cement was mixed after being equally dispensed from the RelyX U200 (3M/ESPE, GmbH, Germany) clicker, as recommended by the manufacturer. The resin cements and the primer components are listed in [Table 1]. Each resin cement was applied to the base of the orthodontic bracket. The brackets were held with orthodontic tweezers to the labial surface of each specimen. A silicon index was fabricated to ensure correct and reproducible bracket positioning at the center of the buccal surface (4.5 mm away from the occlusal plane). A static load of 300g was applied using a customized machine [Figure 3] with a customized stainless steel rod that fit the center of the bracket [Figure 4] to deliver a uniform pressure along the mesh base, thereby ensuring uniform cement thickness. After specimens were inspected for proper adaptation, excess cement was removed using a sharp orthodontic scaler (Dentaurum). The resin cement was polymerized with a light-emitting diode curing light (Radii Plus, SDI, Australia) at a light intensity of 1400 mW/cm2 for 10 s each side. The intensity of curing light was measured after each specimen. All specimens were stored at 37°C in distilled water for 24 h. The specimens then underwent 500 cycles in an electronic thermocycler (JULABO GmbH, Germany) between 5°C and 55°C, with a dwell time of 30 s.
Where F is the force in Newtons, and A is the average surface area of the Discovery bracket mesh base (13.42 mm2). The failure mode was evaluated for all specimens using a 25 × stereoscopic microscope (Leica, Germany) according to the following 4-point scale ordinal: cohesive within cement, adhesive between zirconia/resin, adhesive between resin/bracket, and complex adhesive/cohesive. Data were collected, tabulated, and statistically analyzed using the IBM SPSS statistics 20 statistical package software. The descriptive statistics, mean, standard deviation, maximum, and minimum were presented for each subgroup. Shapiro–Wilk test was used to test the homogeneous distribution of the data. The results revealed that the groups were not normally distributed, so nonparametric Mann–Whitney test was used (α = 0.05) to check the statistical significance of SBS differences among groups and subgroups. A power test analysis was also performed and revealed sufficient power (0.88), thereby indicating the high probability of detecting a significant difference among the tested variables. Descriptive statistics for the SBS are presented in [Figure 6]. The SP subgroup showed the highest SBS (20.8 ± 4.8 MPa, 95% confidence interval 17.7–24.2), followed by the SR subgroup (16.7 ± 4.6 MPa, 95% confidence interval 13.6–19.7). The DP (12.3 ± 2.8MPa, 95% confidence interval 10.3–14.1) and DR (11.6 ± 3 MPa, 95% confidence interval 9.3–13.7) subgroups showed lower SBS values, whereas both the control subgroups CP and CR underwent debonding during thermocycling and were given a zero value. Statistical analysis using Mann–Whitney test among surface treatment groups C, S, and D revealed highly significant differences (P < 0.001). Mann–Whitney test analysis revealed a high statistically significant difference (P = 0.001) among the control subgroups and all other subgroups, as well as between the SP-DP and SP-DR subgroups. 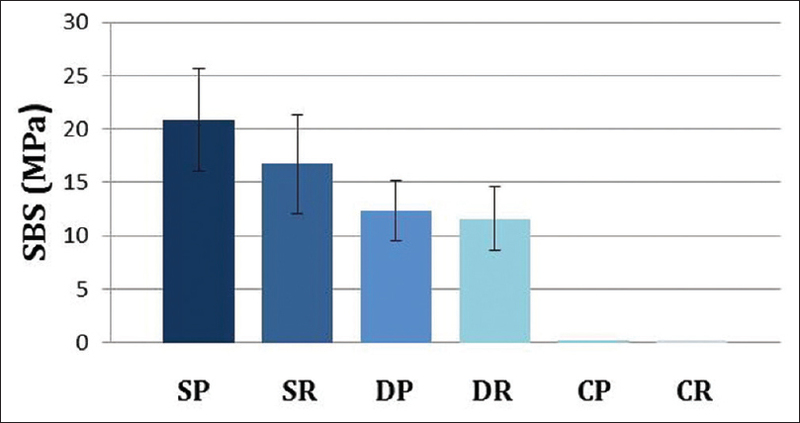 However, no statistically significant differences were observed between the subgroups of the same surface treatment SP-SR (P = 0.165), DP-DR (P = 0.902), and CP-CR (P = 1). The failure mode analysis was performed using a 25× stereoscopic microscope (Leica). Only four specimens of the S subgroups (SP and SR) showed a complex adhesive and cohesive failure, where less than half of the adhesive was left on the zirconia surface [Figure 7]. All the other specimens showed a complete adhesive failure between the zirconia and the resin cement, with no adhesive left on the zirconia surface [Figure 8]. [Table 2] shows the mode of failure of each subgroup. The methodology of this study was aimed at simulating clinical intraoral conditions. Zirconia crowns were fabricated and glazed, rather than discs, to mimic the buccal surface anatomy. The intraoral sandblaster and low-speed hand piece are dental unit equipment that orthodontists use frequently. The specimens were air-abraded with 50 μmAl2O3 particles, since increasing the particle size to more than 50 μm does not increase the SBS but increases the risk of inducing minor cracks in the zirconia surface., Polishing discs (Sof-Lex) were used in this study since they are commercial, readily available, and do not require special equipment. An orthodontic gauge and a silicon matrix were used to ensure that the brackets were bonded at 4.5 mm from the occlusal surface at the center of the bracket mesiodistally. A pointed stainless steel rod was custom-made to fit the center of the Discovery bracket and secure it during cement setting. Discovery brackets are often used as reference brackets, according to the DIN standard 13990. The load cell of 500 N used in the universal testing machine is the optimal load-cell capacity for precise reading with a minimal range of error. The results of this study showed that the surface treatment of glazed monolithic zirconia is the key factor to achieve a durable bond. The air-abraded sandblasted subgroups (SP and SR) achieved the highest SBS because sandblasting increases the surface area, roughness, and wettability of the zirconia surface. The SP subgroup achieved the highest SBS value (20.8 MPa), which was about triple the optimal bond strength required. Similarly, the SR subgroup achieved a high SBS value (16.7 MPa). These results are in agreement with several previous studies,,,, which concluded that sandblasting is a key factor in obtaining a good bond to zirconia, with no statistical significance observed between resin cements/primers that contained MDP and those without MDP. Despite the advantage of achieving durable bonds after sandblasting the zirconia surface, high debonding forces may induce minor cracks, especially if the monolithic zirconia crown is thin. Furthermore, complex cohesive–adhesive failures were observed with both cements. Removing the cement remnants after debonding may further damage the zirconia surface and is time-consuming. The results for the D subgroups showed that the glazed zirconia surface treated with Sof-Lex discs attained double optimal bond strength with both cements, DP (12.3 MPa) and DR (11.6MPa). These SBS values pose less risk of damaging the zirconia surface during debonding when compared with sandblasting. Moreover, no remnants were detected on any of the zirconia surfaces after debonding. This allows the orthodontist to easily repolish the bonding surface using smoother Sof-Lex discs (medium, fine, and superfine) to gain a smooth and glossy surface. The results for the resin cements used indicated no significant difference between the use of CCP + Panavia F2.0 or self-adhesive RelyX U200 between subgroups of the same surface treatment, and similar findings were noted by Sanli et al. Only when preceded by sandblasting, the CCP + Panavia treatment achieved a noticeably higher SBS. This may be due to the areas where the glazed layer had been removed, allowing the MDP molecules to bond to the exposed oxides on the zirconia surface. This finding agrees with many previous studies in which sandblasting and MDP primer/resin cement were applied., Conversely, no advantage was evident in using CCP + Panavia, either on the specimens that were treated with Sof-Lex discs or on the control specimens. This could be explained by the weak bond between MDP and the silica molecules embedded in the glazed layer. RelyX U200 achieved good SBS values when combined with sandblasting or Sof-Lex discs surface treatments. 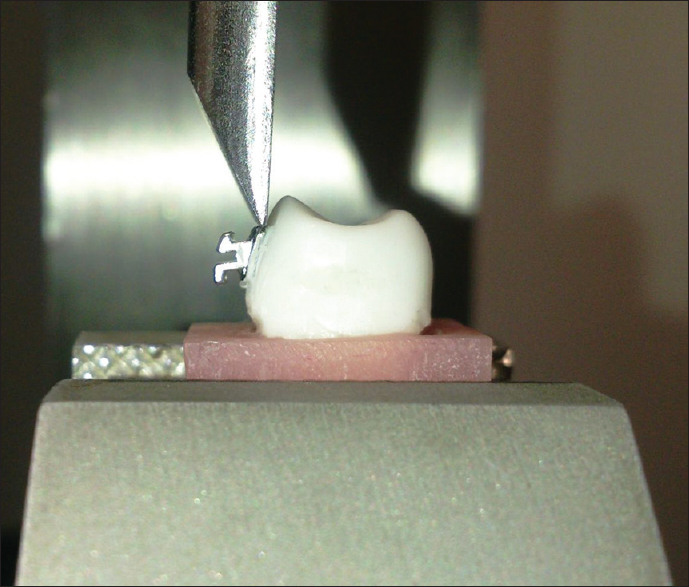 Self-adhesive resin cements are less promising in achieving a durable bond to zirconia after thermocycling. However, the presence of silica particles in the glaze layer enhances the bond with the phosphoric acid methacrylate monomer found in RelyX U200. The usage of RelyX U200 saves the time of applying an additional primer, and thus is less technique-sensitive. All the control specimens of both resin cement subgroups (CP and CR) underwent debonding during thermocycling. This highlights the importance of treating the glazed zirconia surface prior to bonding and illustrates the advantage of the mechanical retention that is created. Further studies are recommended to evaluate the effects of other surface treatment methods and cements/primers on the SBS between orthodontic brackets and monolithic zirconia crowns. Within the limitations of this study, it was possible to conclude that glazed monolithic zirconia crowns require special surface treatment prior to bonding of orthodontic brackets. Sandblasting achieved the highest SBS, but it required special equipment. On the other hand, treating the surface of glazed zirconia with a coarse Sof-Lex disc proved to be an alternative convenient method that orthodontists can easily apply. Both cements, Panavia and RelyX U200, achieved adequate bonding results. Special thanks to the Dean of the Faculty of Dentistry at Beirut Arab University, Prof. Essam M. H. Ossman, for facilitating this work. Van der Zel JM. Zirconia ceramic in dental CAD/CAM: How CAD/CAM technology enables zirconia to replace metal in restorative dentistry. J Dent Technol 2007:16-24. Tinschert J, Schulze KA, Natt G, Latzke P, Heussen N, Spiekermann H. Clinical behavior of zirconia-based fixed partial dentures made of DC-Zirkon: 3-year results. Int J Prosthodont 2008;21:217-22. Al Taki A, Guidoum A. Facial profile preferences, self-awareness and perception among groups of people in the United Arab Emirates. J Orthod Sci 2014;3:55-61. Buonocore MG. A simple method of increasing the adhesion of acrylic filling materials to enamel surfaces. J Dent Res 1955;34:849-53. Cevik P, Karacam N, Eraslan O, Sari Z. Effects of different surface treatments on shear bond strength between ceramic systems and metal brackets. J Adhesion Sci and Technol 2017;31:1105-15. Kern M, Wegner SM. 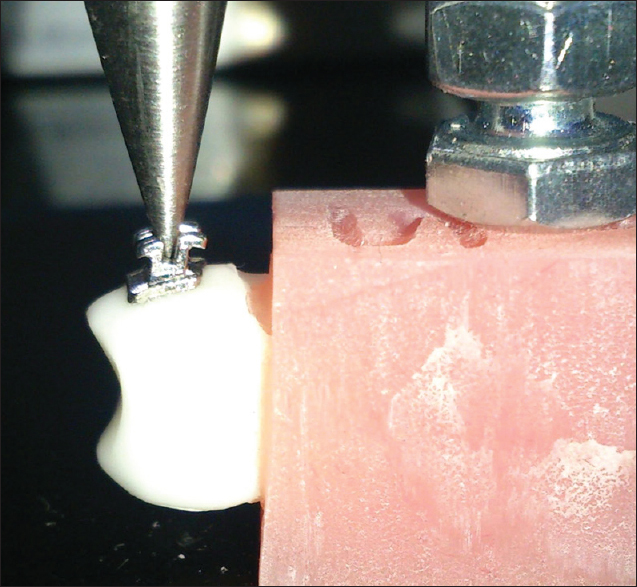 Bonding to zirconia ceramic: Adhesion methods and their durability. Dent Mater 1998;14:64-71. Moon JE, Kim SH, Lee JB, Han JS, Yeo IS, Ha SR. Effects of airborne-particle abrasion protocol choice on the surface characteristics of monolithic zirconia materials and the shear bond strength of resin cement. Ceram Int 2016;42:1552-62. Reynolds IR. A review of direct orthodontic bonding. Br J Orthod 1975;2:171-8. Gotti VB, Calabrez Filho S, Shimano MM, Borges GA, Gonçalves LD. Influence of ceramic primers on microshear bond strength between resin cements and zirconia-based ceramic. Braz J Oral Sci 2011;10:124-9. Atsu SS, Kilicarslan MA, Kucukesmen HC, Aka PS. Effect of zirconium-oxide ceramic surface treatments on the bond strength to adhesive resin. J Prosthet Dent 2006;95:430-6. Blatz MB, Alvarez M, Sawyer K, Brindis M. How to bond zirconia: The APC concept. Compend Contin Educ Dent 2016;37:611-7. Rebholz-Zaribaf N, Özcan M. Adhesion to zirconia as a function of primers/silane coupling agents, luting cement types, aging and test methods. J Adhesion Sci and Technol 2017;31:1408-21. Kou W, Molin M, Sjogren G. Surface roughness of five different dental ceramic core materials after grinding and polishing. J Oral Rehabil 2006;33:117-24. Hmaidouch R, Müller W-D, Lauer H-C, Weigl P. Surface roughness of zirconia for full-contour crowns after clinically simulated grinding and polishing. Int J Oral Sci 2014;6:241-6. Blöcher S, Frankenberger R, Hellak A, Schauseil M, Roggendorf MJ, Korbmacher-Steiner HM. Effect on enamel shear bond strength of adding microsilver and nanosilver particles to the primer of an orthodontic adhesive. BMC Oral Health 2015;15:42. Bishara SE, Ostby AW, Laffoon JF, Warren J. Shear bond strength comparison of two adhesive systems following thermocycling: A new self-etch primer and a resin-modified glass ionomer. Angle Orthod 2007;77:337-41. Skainhe HS, Rayyan MM, Khalil MF. Influence of surface treatment protocols on shear bond strength of veneering composite to zirconia. Dent J 2013;59:4595-601. Tsuo Y, Yoshida K, Atsuta M. Effects of alumina-blasting and adhesive primers on bonding between resin luting agent and zirconia ceramics. Dent Mater J 2006;25:669-74. Meng XF, Xie ZG, Chen YH, Gu N. Effects of sandblasting on surface character and resin bond of zirconia ceramic. Zhonghua kou qiang yi xue za zhi [Chinese Journal of Stomatology] 2011;46:370-4. Yang B, Barloi A, Kern M. Influence of air-abrasion on zirconia ceramic bonding using an adhesive composite resin. Dent Mater 2010;26:44-50. Lee JH, Lee M, Kim KN, Hwang CJ. Resin bonding of metal brackets to glazed zirconia with a porcelain primer. Korean J Orthod 2015;45:299-307. Sanli S, Comlekoglu MD, Comlekoglu E, Sonugelen M, Pamir T, Darvell BW. Influence of surface treatment on the resin-bonding of zirconia. Dent Mater 2015;31:657-68. Curtis AR, Wright AJ, Fleming GJ. The influence of surface modification techniques on the performance of a Y-TZP dental ceramic.J Dent 2006;34:195-206. Thompson JY, Stoner BR, Piascik JR, Smith R. Adhesion/cementation to zirconia and other non-silicate ceramics: Where are we now? Dent Mater 2011;27:71-82.